Add ¼ cup of the olive oil to a large saucepan over high heat. Add the reserved shrimp shells to the pan and cook for 2 - 3 minutes, stirring occasionally. Add the water and 1 tablespoon of Fish Base to the pan and bring to a boil, reduce the heat and simmer for 15 minutes. Remove the shrimp shells from the water and discard. Bring the liquid back to a boil and slowly stir in the grits. Reduce the heat and simmer, stirring constantly for 5 minutes. Add the remaining olive oil to a large sauté pan over medium high heat. Add the shrimp to the pan and cook for 2 minutes per side. Add the garlic, Hot Sauce and remaining Fish Base to the pan and cook for 1 minute more. Remove the pan from the heat and stir in the butter and parsley. 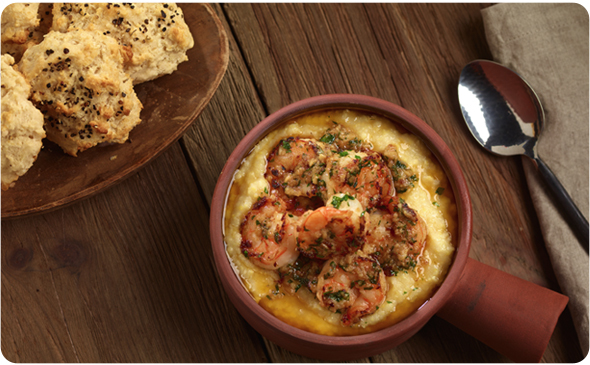 Add ½ cup of grits and 5-6 shrimp per bowl.